In 1842, a 28-year-old French Jew named Alphonse Ratisbonne was visiting Rome. He was the youngest son of an important banking family in Strasbourg, a close relation of the Rothschilds. As often happens with European Jews, a family takes the name of a city. The French Ratisbonne comes from Ratisbona, the Latin name for Regensburg, a famous German city near Munich. Alphonse was a Jew by race and religion, virulently anti-Catholic, and libertine in his customs. Alphonse Ratisbonne was making a tour of Europe and the East before settling to marry his cousin Flore and assume a partnership at his uncle’s bank. Ending by coincidence in Rome instead of Palermo as he had intended, he was well received by the French diplomatic circle residing there. He reluctantly made a call on Baron Theodore de Bussières, a very fervent Catholic. Even though the Jew seemed quite far from any conversion, the Baron, undaunted by his sarcasm and blasphemy, saw in him a future Catholic and encouraged his visits. The Baron and a close circle of aristocratic friends increased their prayers for the skeptical Jew. Notable among them was a devout Catholic who was seriously ill, Count Laferronays, who offered his life for the conversion of the “young Jew.” On the same day he entered a church and prayed more than 20 Memorares for this intention, he suffered a heart attack, received the last Sacraments, and died. The next day, his friend Baron de Bussières was on his way to arrange the Count’s funeral in the Basilica of St. Andrea delle Fratte when he met Ratisbonne. He asked him to accompany him and wait in the church until he had arranged some matters with the priest in the sacristy. Ratisbonne did not accompany his friend into the sacristy. He wandered through the church admiring the beautiful marbles and various works of art. As he stood before a side altar dedicated to St. Michael the Archangel, Our Lady suddenly appeared to him. It was January 20, 1842. His conversion had enormous repercussions over all Christendom. The entire Catholic world became aware of it and was impressed by it. 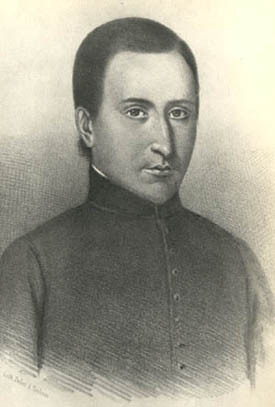 Afterward, Ratisbonne became a Jesuit priest. Ten years later, he and his brother Theodore, who also had converted from Judaism, founded a religious congregation - the Congregation of Sion - turned to the conversion of the Jews. Shortly after the apparition, based on the description of Fr. 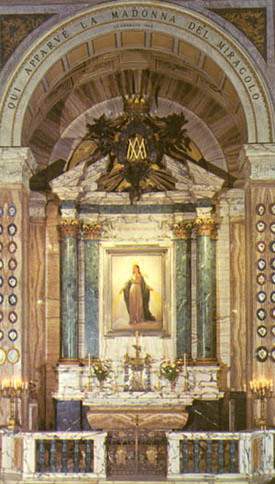 Ratisbonne, a picture was painted representing Our Lady who had appeared to him that day in Sant' Andrea delle Fratte. When the picture was completed, he viewed it and said that it only vaguely depicted the beauty of the apparition he had seen. This is not difficult to believe since the actual beauty of Our Lady must far surpass any mere representation. 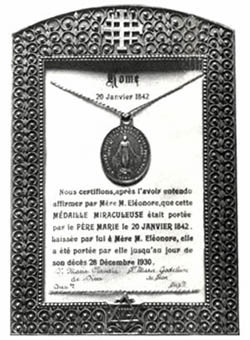 The picture was placed on the exact spot where she had appeared to him, and became know as Madonna del Miracolo, Our Lady of the Miracle, referring to the two-fold miracle, her apparition and the instantaneous conversion of Alphonse Ratisbonne. Obviously, that apparition represented a great benefit for the soul of Ratisbonne. It also represented a benefit for the Catholic Church with the foundation of the Congregation of Sion, with its special mission to work for the conversion of the Jews. This congregation expresses well the Church’s position toward the Jews. Her position is not to hate the Jews, but rather to defend herself against their attacks. To the measure that they attack the Church, she defends herself. But above all, she desires their conversion, the eradication of Judaism as a religion, and the entrance of the Jews into the Catholic Church, which is the true continuation of the chosen nation. But in the doctrinal and psychological context of those times, the Ratisbonne miracle had a more profound significance. In the 19th century, the Revolution was strongly promoting Rationalism, a school of thought that today has become outdated. Then the Revolution was emphasizing this point: the rational man, the man who tries to determine everything according to reason, cannot find the necessary supports in reason to believe that God exists, that the Catholic Church is the true Religion, and that she was founded by Jesus Christ. Therefore, the Revolution concluded, the entire Catholic edifice of doctrines cannot be accepted by human reason. Those revolutionary assertions were just myths, like the Roman mythology or legends of the indigenous and African peoples. Most of the rationalist arguments were chicaneries or sophisms, with only a few proceeding from captious arguments. But because the Revolution insisted relentlessly on those points and presented a torrent of objections to Catholic doctrine, many people of that time lost their faith. To counter this unrelenting wave of attacks against the Catholic Faith, Our Lady appeared and made miracles in several places. The miracle of Ratisbonne’s conversion that took place in Rome shook up all of Christendom. In those times there was not this accursed ecumenism we are witnessing today. Then, the separation of the religions was much deeper and, therefore, so also was the gorge that separates truth from error, and good from evil. A wealthy and influential Jew, with absolutely no reason to favor the Catholic Church, suddenly converted because he saw Our Lady. He gave proof of his sincerity by giving up his positions in the world and breaking his advantageous engagement. He embraced the religious life, and founded a religious congregation to convert other Jews and to combat Judaism. It is impossible to imagine a more objective proof of the truth of the apparition. This episode had an enormous impact throughout Italy and France, and then the whole Catholic world. It was evidently a miracle, a miracle that fell from Heaven like a drop of water on a parched mankind that was being influenced by the rationalist myths of the Revolution. Divine Providence had done something very similar already in 1830 with the apparitions at Rue du Bac (Paris) to St. Catherine Labouré. There, among other things, Our Lady gave the world the Miraculous Medal, opening a torrent of graces and miracles for mankind. Our Lady also appeared in the grotto at Lourdes in 1858, and soon after there were reports of many miracles of healing for those who bathed in its waters. 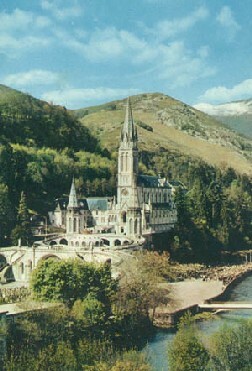 The miracles of Lourdes constitute the longest series of miracles ever to occur in the History of the Church. Inserted in this general sequence is the apparition of Madonna del Miracolo to Alphonse Ratisbonne. This series of apparitions and miracles was the blow Our Lady chose to give to the Revolution at that time. She counter-attacked with a skillful strategy, very well calculated. It was her way to smash the head of the serpent. The very head of Judaism was smashed by the public witness of an important Jew who affirmed that the Catholic Church is true. We should, therefore, analyze the miracles Divine Providence gives, looking for the higher rule that governs them. Miracles become more frequent in the epochs when they are more necessary. Today we have reached the situation where the action of the Devil is becoming more evident with each passing day. I am speaking not only about UFOs and the hippy revolution. It is clear, in my opinion, that these phenomena are linked to a preternatural invasion. I am referring also to the death of rationality in public opinion. That men effectively stopped using their reason - as they did in the '80s and '90s - and acted only by temperamental impulses is something that cannot be explained except by a special action of the Devil. He is making an enormous effort to keep the Revolution going, notwithstanding its failure to convince public opinion. Since we cannot explain this preternatural action, it is also difficult to combat it efficiently. It continues to grow and is reaching such an apex that it seems to me that an astounding miracle is necessary. What kind of miracle will it be? What would be the miracle that could move contemporary man to return to the Catholic Faith? The mysterious designs of God are beyond the knowledge of man. But this does not prevent us from speculating based on what He has done in the past. Contemporary man has reached such a hardness of heart that he is no longer touched by miracles like the one that took place with Ratisbonne, nor the series of miracles at Lourdes. First, we are in need of a miracle that would move the good Catholics to be unafraid to disagree with the prevailing opinion of the revolutionary milieu around them. They should become indifferent to that opinion. Further, they should take the offensive against it. This is the first part of what is necessary. It was what happened at Pentecost. Tongues of fire appeared over the Apostles, and they left the Cenacle with the courage to face everyone. Before this, they were cowards, but with this they became invincible fighters. Was it something interior or exterior that took place there? I do not know. The whole city of Jerusalem heard an enormous exploding sound that came from the Cenacle. Therefore, it seems that it was not only an interior action within their souls, but that it was preceded or followed by some exterior miracle. What really happened there we do not know. But since today commemorates the Madonna del Miracolo, we should ask Our Lady to give us a similar miracle to transform us into the Apostles of the End Times predicted by St. Louis Grignon de Montfort. Second, this divine intervention should be a chastisement that would punish the world for its acceptance of and concessions to the Revolution, and especially for the sin committed within the Catholic Church. To be more clear, for the acceptance of Progressivism within the Church even to her highest summits. I am referring to the chastisement Our Lady predicted in Fatima in which many nations will disappear. 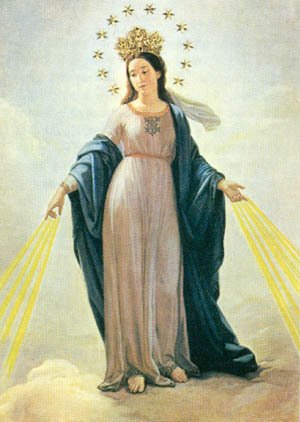 The miracle of the sun that left its orbit and raced toward the earth seems to prefigure a cosmic chastisement where the very equilibrium of the sun may be altered in obedience to a command of Our Lady. What would be the consequences in our solar system if the sun would actually shake and change its course for a short period of time? Such a cosmic disequilibrium could produce all kinds of meteorological catastrophes on the face of earth, destroying countless things and people. Even after that, many of the people who survived these catastrophes would still need the miracle of a conversion like the one Ratisbonne experienced. Both of these perspectives point to grandiose miracles necessary to make contemporary men return to the right path and make possible the Reign of Mary, as Our Lady predicted in Fatima. In order to be prepared for such miracles, I would advise praying the Memorare, the prayer that Ratisbonne said before his conversion. We should pray it often, asking the Madonna del Miracolo to give us these two miracles and the victory of the Holy Church over the Revolution. The texts of both the biographical data and the comments come from personal notes taken by Atila S. Guimarães from 1964 to 1995. Given the fact that the source is a personal notebook, it is possible that at times the biographic notes transcribed here will not rigorously follow the original text read by Prof. Plinio. The commentaries have also been adapted and translated for TIA's site.